Here you go……..add some more fun to the cloth baby toy collection. Go on, downsize that scrap box. Start by cutting out your squares. Then, sew 4 of your squares together to make the main body of your block. Then, snip little corners (1/4 x 1/4 inch) out of all four corners of your two remaining squares. Then pin it to the main body, with right sides together. Fold the little square openings together at the sides, creating a square corner as you pin. Do the same with the bottom but leave one side open so that you can turn it right side out. Turn it right side and and poke out the corners so that they are nice a sharp/crisp. Stuff with batting. Fill it up pretty well so that the block will hold its shape. Fold down both sides of the opening a 1/4 inch and hand stitch it closed. Now you have a block (or blocks) to accompany your rings. So today I have just been looking at different blogs (just procrastinating that paper), and I have come across a ton that mention you. It’s like your some hot celebrity (we’ll you are)! Love the blog. In a few weeks hopefully I can start on a few projects instead of writing papers. It was great talking the other day. Not just friends blogs but other craft blogs everywhere that refer to your tutorials! Stumbled upon your blog, LOVE it! Congrats on your wonderful creativity. I visit check back often, thanks for some fun things to create. I’ve actually beat you to the punch on this one lol I made some of these last summer as a baby gift, they’re great! Love the blocks, RaeLynn and I made a few just the other day!! I didn’t think the girls would be that interested in them, but them love just throwing them around!! I made one with tags, so much fun!! I also love the rings, what a good idea!! Thanks for all your wonderful ideas!! I just came across your blog and L-O-V-E all of your great ideas! Can’t wait to get started on some of them. Thanks for sharing! Wow, these are fantastic! I would love to link to these if you didn’t mind! I can’t believe I haven’t come across your blog before now! I LOVE your stuff- you have a great eye for color! I love your step by step! Hermosos colores para la composición! Muy linda lña conbinacion de las telas. Congrats on your wonderful creativity. I saw some cloth blocks for sale that had slots for pictures. My husband reminded me that I bought clear vinyl for your eye spy bag project and that you had cloth blocks on your blog (what do you know… my husband’s addicted too!) You could make photo blocks by using this pattern and some clear vinyl!!! I’m not the best seamstress, but I just might try it! Super cute ideas!!! I’m always saving those tiny bits of fabric thinking that I’ll make something like bean bags out of them. Love the block and rings especially with so many babies coming up in my family. I was also going to mention that you could throw some bells or things that make sounds in the middle of them. Thanks for sharing. Any tips on how to stuff? Mine always come out lumpy! Cynthia…….try shoving more of the filling in. And then kind of mush it around. But the more filling, them better shape you'll get. Hope that helps! 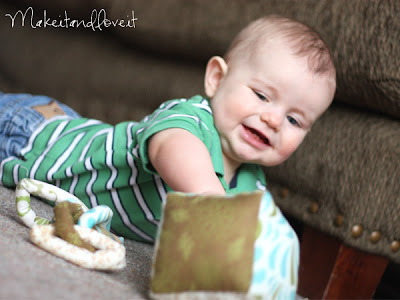 I sew two of them, one with a little rattle in the belly, and one with many different tags around the edges, but my 8 months old son loves rather the solid, hard things, less the softies. I also made a ring-chain, and i used clattery nylon shoppingbags to fill a few of the rings, for an added effect. Thanks for the awesome tutorial! I just made one this afternoon. (Pictures here: http://feathersinournest.blogspot.com/2010/02/nursery-project-cloth-cube.html) Thanks for the inspiration! I love these blocks! my son love a "crinkle" noise. So I put a bunch of plastic grocery sacks in that I have a ton of leftover of and he loves the noise he can make. I love these blocks! I definitely have to bookmark this (and add it to my growing collection of to-do's). I can't wait to make this for several up and coming babies! Thanks for posting this! 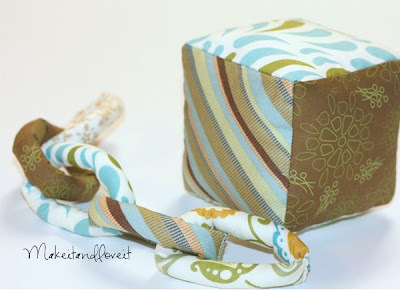 I made a taggie cube for a friend's baby shower, kind of spinning off your cube, and had so much fun with it, I think it's going to be a normal part of gifts I give at baby showers! I love this pattern, but I have a quick question. When I make them, they always loose their shape and come out more like blobs than blocks. I've tried more stuffing, less stuffing, but can't seem to get them to look like a cube. Any tips on getting them to hold their shape? I did these on my blog also. I did mine with pictures that I had printed onto the fabric. Yours are awesome. I like your fabric. I had seen that fabric at the store but I don't think I would have thought to put it together. Great tute! Looks easy but I had a hard time! Mine always ended up with corners that didn’t match up and two sides were bulgy instead of flat and square…..
Made blocks tonight. Doing matching rings and a matching giraffe tomorrow! Wanting to do a set of matching toys as a baby shower gift! So much cheaper than buying toys at the store, and so cute! Just want to say thank you to all of your great posts because it is so helpful and I learn from them so much, especially those sewing tip for beginner like mine. Please keep posting more tip for person half way of the world like mine to learn and share. Just one question, will you create a tip how to sew button holder soon? Mine wont meet a the corners too…any tips? I really like your step by step instructions and the fact that you have pictures, so far a lot of the projects that I’ve been interested in doing don’t. i can’t wait to make a bunch of these for my sisters new baby!!! It is actually a nice and helpful piece of information. I’m glad that you simply shared this useful info with us. Please stay us informed like this. Thank you for sharing.